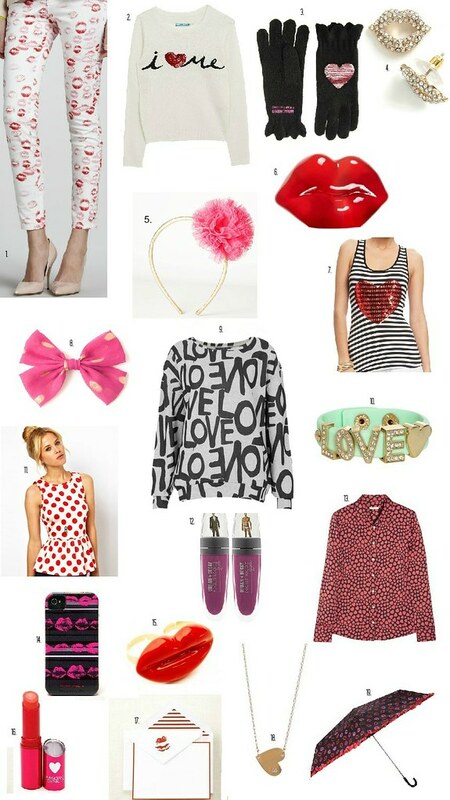 Here are some sweet kiss and heart-themed items that are perfect even after Valentine's Day is over! 3.) Moschino Cheap & Chic Sequin Heart Gloves, $173.65 $66.65 *On Sale! ASOS *Use code: VALENTINE10 for 10% off everything! 10.) Rhinestone Love Cuff, $10.50 WetSeal *Buy 1 get 1 50% off! 11.) Sleeveless Top With Peplum In Spot Print, $43.85 ASOS *Use code: VALENTINE10 for 10% off everything! 13.) Factory printed silk two-pocket blouse, $98 J.Crew *Take an extra 30% off everything with code: XOFACTORY! These are such darling picks! I am lovin' #8!